With the cooking and planning for the Indian States, occupying most of my thoughts, it was quite hard to cook anything new or even new for this space. Well no excuses, I wanted to simply do something new today, and not just keep on the Menus that I have been doing it lately. 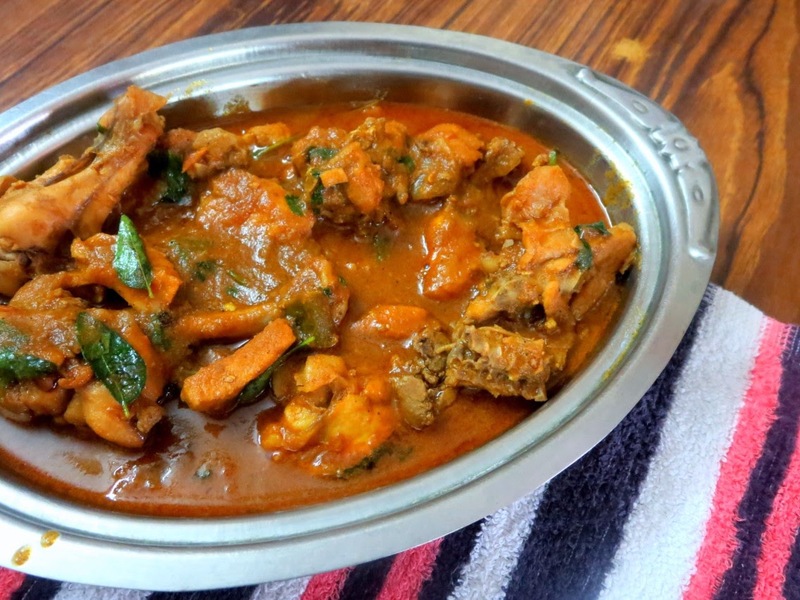 Anyway one might wonder what’s new with this chicken curry, the recipe is shared by my aunt. Amma made it without coconut, and though she doesn’t eat, said everybody loved it. So the entire credit for today’s post goes to Amma for cooking it and Konda for clicking it. I have been telling them that I haven’t posted any non veg dishes offlate, so remembering that in mind, when she made a new version of the same old chicken gravy, Amma thought she would ask Konda to click pictures. When I was asking Amma for the recipe, I was surprised to notice that it’s made without coconut and to get more gravy, extra coriander powder is added and for the amount of gravy you want, you simply add that amount of water and adjust spice and simmer to cook to get a good gravy. Heat a kadai with oil, saute the onions till they start turning brown. Then add the ginger garlic paste. Saute well. Then add the coriander powder, chili powder and fry well. Next add the tomato puree and continue frying till the oil comes out. Now add the chicken pieces and saute in simmer. Continue sauteing till the moisture that comes out, gets cooked up. Finally add the salt and turmeric powder and cook again. Once the chicken is well coated with the spice powders, add the amount of water you was as gravy. Bring to boil and then simmer for 15 mins. Garnish with coriander leaves and serve with rotis. Enjoy with your Rice or Rotis! The curry looks so good. I think it is always correct when they say you don't need so many ingridients to have a delicious plate of food.